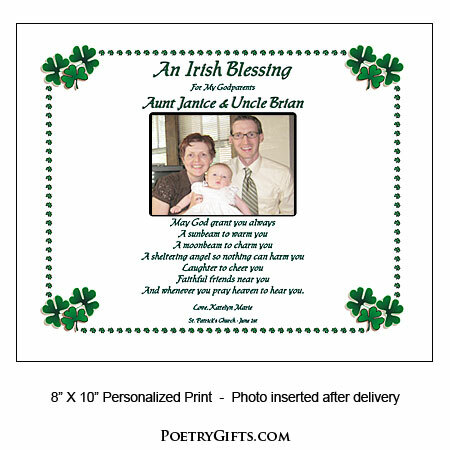 A Godmother or Godfather doesn't need to be Irish to appreciate this Godparent Irish Blessing gift. 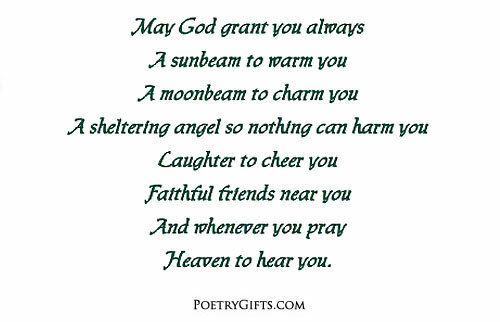 This timeless and uplifting poem is a perfect Thank You gift from a Godchild on his or her Baptism or Christening Day. If the child's Baptism Day has already passed, consider giving this personalized Poetry Gift as a Godparent birthday present. It's an honor to be chosen as a Godparent. Your child's Godmother and Godfather will play an active role in their Godchild's life. 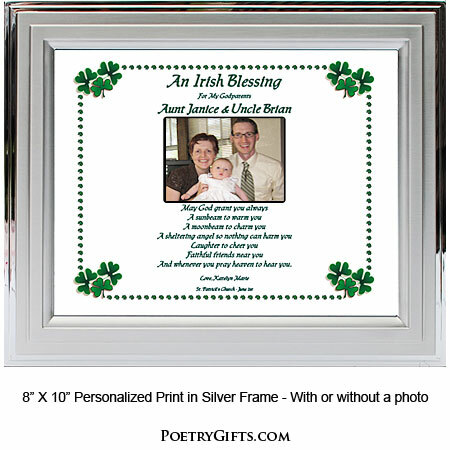 Thank them for being there on your child's Baptism/Christening Day and for all of the years to come with this meaningful and lasting Godparent Irish Blessing Poetry Gift. 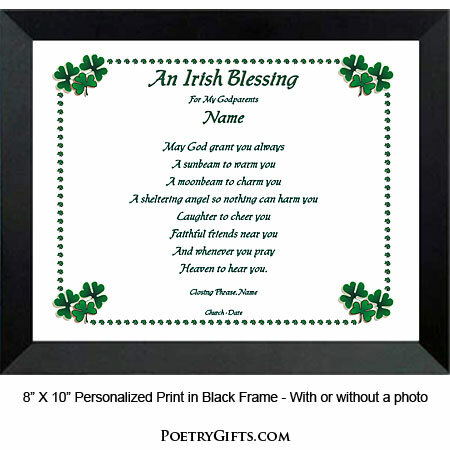 There are many ways to personalize this poem to make it an extra special thank you gift. (see above Personalization options) When you add a photo of the Godchild and Godparent it becomes a treasured keepsake. 5. Closing Phrase and Child's Name(s) (as seen after poem) - Examples: Love You, Kaitlyn Rose; All Our Love, Sean Patrick & Eileen Marie; etc." 4.5 out of 5, Based on 2 Reviews. I was pleased with this but I do think it is a little expensive for what you get! The godparents loved it and it was nice to be able to pick my own frame! What a beautiful gift! I was looking for an original gift for Godparents, and found it here. Excellent quality, love that I could frame it myself to save on cost, and extremely fast delivery. I would definitely recommend this to anyone looking for a unique gift.